The biggest challenge with technology is always learning to use it. Until digital tools become second nature we always find fault with the UX, complain about the process and eventually abandon it in search of something better. Good design creates a memorable user experience and keeps us coming back for more. It must look interesting and appealing and feel natural, not forced. Evernote doesn’t really feel natural, nor does it look great. But one could argue technology is also only as good as the user. As most of my classmates have listed in their reviews, there are great aspects to Evernote. It helps gather information quickly and easily, clipping items or whole pages as you research. 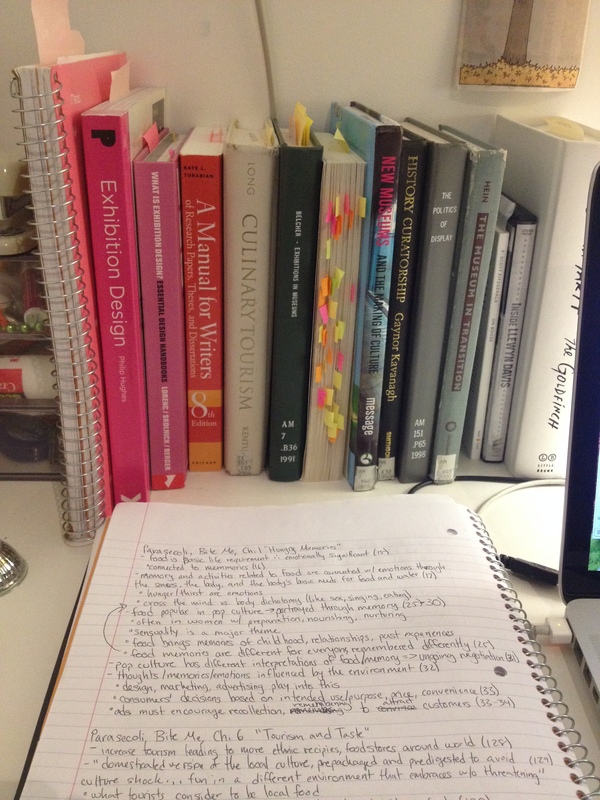 It allows for easy organization and recalling your notes but only if you put in the time to organize and create tabs. You have to want to make it work. You have to have found some kind of spark and want to use it everyday. Oddly, my program (Costume Studies) does not allow technology in classrooms of any kind—no computers, phones, etc. All notes must be written using pen and paper. If I could use Evernote ongoing, from class to class, it might make navigating and exploiting all its benefits that much easier. Using it in Creating Digital History has proven to make note taking a hundred times easier and the quality is infinitely better than using a pen and paper or trying to organize a notebook. We want digital tools and technology to conform to our practices and preferences and function exactly as we do. We also want it to happen immediately, with little effort. As history has proven, mass-adopted technological developments are few and far between. Many have tried to create new ways to gather and share information but not many have succeeded for the long term. But they keep on trying. On the other hand, there are those platforms or devices that have changed our lives forever. These are the tools have helped change the way we learn, communicate, and think. Think iPhone (yay!) vs. Apple watch (boo!). Yet, every digital platform created is a small advancement and opportunity to create something better. It just takes time and practice. In short, I am going to keep on working with Evernote and see where it goes. Would upgrading make it better? Perhaps. A very good friend of mine swears by Evernote for all aspects of her life. She uses it for recipes, personal organization and work. It gives a 360-degree view of her life, all of which she can access via her phone. That makes her happy and I find it inspiring. Evernote might, given some more time and patience, help me to become the great note taker I have always wanted to be, or at least become a little bit better. I remain hopeful! I’ve spent the last two years in library school, but somehow it still never occurred to me to use note-taking and information management software for my own purposes until I took this class. I’ve used the same system for note-taking and information storage since my freshman year of college. Though for the most part it has served me well, I have noticed that as projects got larger, I tended to spend much more time skimming frantically through multiple documents searching for one thing I vaguely remembered reading somewhere. Evernote’s full-text indexing and searching, as well as its tagging feature, have helped me synthesize my research and complete my assignments more efficiently. I typically take notes in an outline format using word processing software. It’s not a very sophisticated system, and it transferred almost seamlessly into Evernote. The one incredibly small issue I had with it is that when taking notes, I tend to have the active document on the left side of the screen, and other documents (for reference, etc.) to the right side of the screen. I think this is a holdover from when I took notes on paper: since I’m left handed, my paper was always on the left, and my book was always on the right. Evernote’s layout (as far as I know) can’t be switched around, so it took a little practice to get used to referring to the right side of my screen for the active document. I wonder if Ned Flanders’ Leftorium has expanded into software yet…. Tagging was probably the feature of Evernote that I enjoyed the most. (Full-text searching across the entirety of the documents in the database was a close second, but it doesn’t save that much more time than searching OCR-ed PDFs individually.) Being able to supply my own more detailed and granular metadata made it much easier and faster to retrieve information. My previous storage system used hierarchies of folders to mimic a very rough tagging system, but it doesn’t allow me to associate multiple tags with the same object, and tends to involve a lot of clicking. It also requires me to remember where in the multi-folder hierarchy I saved a document: since I couldn’t associate multiple categories with objects, if an object applied to more than one folder category, I would save it on the same level as both folder categories. I thought this was ingenious when I “invented” it in college, but now I realize that it was NOT the best way to do things. Rather than relying on the OS X directory structure to organize my research, I should have investigated third party software sooner. It would have made my senior thesis much less frustrating. I wish that the tagging functionality in Evernote did allow for some hierarchical organization, if only for the sake of having a neater-looking and more navigable tag page. I can imagine that for projects longer and larger than this one, the tag page in Evernote gets very messy, very fast. I also wish that I had spent a little more time developing my tagging system. Some tags ended up referring to too many notes to be of much use, and I wasn’t always consistent about applying both subject- and format-related tags to notes. (This is another example of how hierarchical tagging in Evernote would be useful: I could tag notes related to people or places as “visual” or “non-visual,” depending upon whether they included illustrations that I could use in my archive or exhibit.) I’ll keep that lesson in mind when I begin organizing my capstone research. I did not end up using Evernote to draft my blog posts or exhibit text. I need a visually “quiet” desktop environment for writing, and Evernote just has too many things going on that catch my attention and distract me. I also did not use Evernote to store most of the items I used in my digital archive, since the free version only permits a ludicrously small amount of data to be imported every month, and I’m pretty sure a single TIFF would exceed that allowance. Even the relatively low resolution JPEG photographs of archival materials that I took on my phone were too large to import in a single month. At least the Web Clipper can download PDFs directly into Evernote without using the imported data allowance! I would probably have stopped using Evernote if that function didn’t exist. One other slight roadblock to using Evernote as the one database to rule them all was the fact that I ended up needing to use several books in my research. It would be really great if Evernote had a mobile application similar to the Web Clipper, which provided document scanning and OCR functionality through smartphone cameras. The fact that this doesn’t exist yet makes me think that it’s because of (everyone’s favorite!) copyright law. The Web Clipper can download PDFs exported by academic publishers’ databases, but it doesn’t work even for single (full) pages of books in ebrary or other access platforms for e-books which are still under copyright. Evernote’s Web Clipper is only one of many content-scraping web tools which have various legitimate and nefarious applications, and which publishers’ digital rights management software is built to block. Print books don’t have the same DRM software built in, but Evernote’s developers could still be sued by publishers for facilitating users’ copyright infringement if they did provide a document-scanning app like the one I described above. Evernote is not a perfect solution, but no software ever is. Furthermore, most of my frustration with the software was the result of my being too cheap to upgrade to a paid version, and I recognize that it’s not entirely fair to blame the product itself for the business model which supports it. It would be nice to have a free, open-source platform with similar functionality to Evernote. After my experience using Evernote for this class, I plan to investigate those options further before I begin the research for my capstone project next semester. However, if that search is unsuccessful, I’ll probably pony up the $50 for a yearlong Evernote subscription. Scrivener: Too Much of a Good Thing? 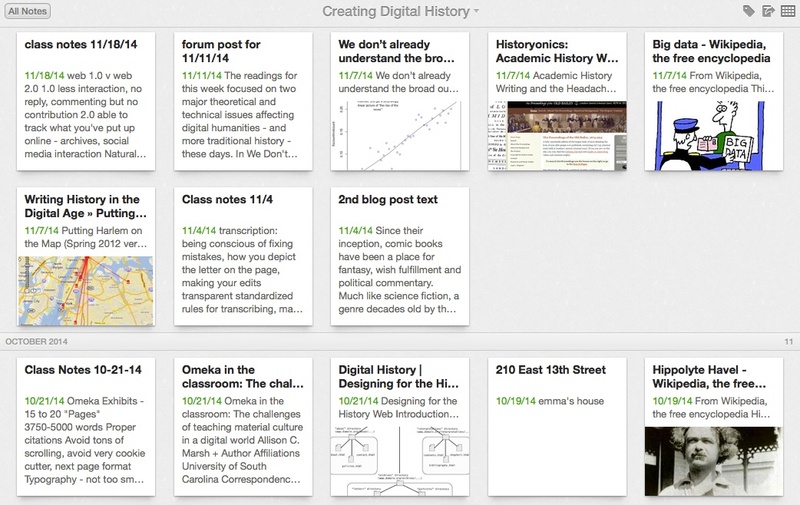 When Cathy asked our class to organize our research projects with Evernote, I was more than hesitant. Past experience had made me a healthy skeptic of the green elephant and its web clipper. Instead, I turned to Scrivener. Scrivener is a sort of souped-up Microsoft Word, a word processing computer app marketed to authors, scholars, and would-be authors and scholars. As with Word, you can change the font, text alignment, and spacing; but Scrivener also comes with certain bells and whistles that supposedly make it easier to generate long bits of writing. I soon realized that those same tools—a host of extra metadata fields, multi-document view options, and organizational offerings—also made Scrivener a stealthily capable program for note taking. All through college, I never really found my ideal note taking process. Sometimes I would print readings out and keep all my notes on the paper. Sometimes I would leave the readings on my computer and take notes on paper while I read from a screen. Neither had any particular drawbacks, or overwhelming appeals. They got the job done and I never felt a strong need to find something more efficient or useful. This, of course, does not mean I didn’t face my share of frustration when it came to trying to shape my notes into something worth reading. All that said, Evernote really appealed to me when I first started using it. My ability to keep things all in the same place was great, and I could search to find what I needed without issue. 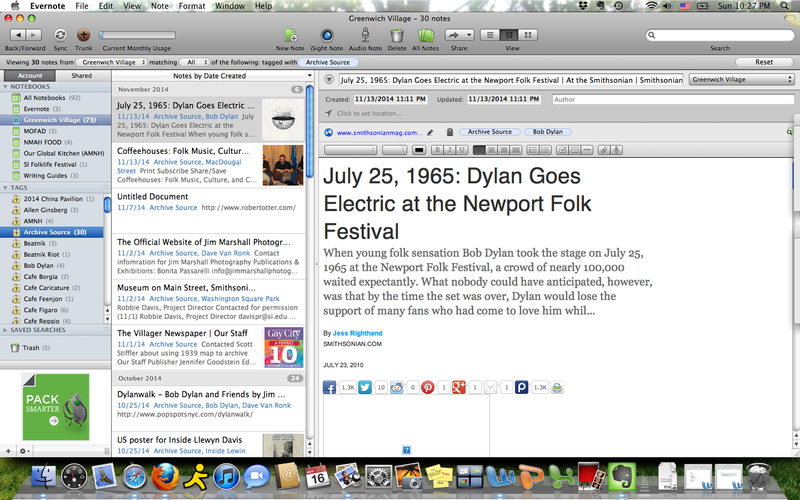 Most of all, the web clipper helped me do online research without clunky bookmarks, or copy and pasting. 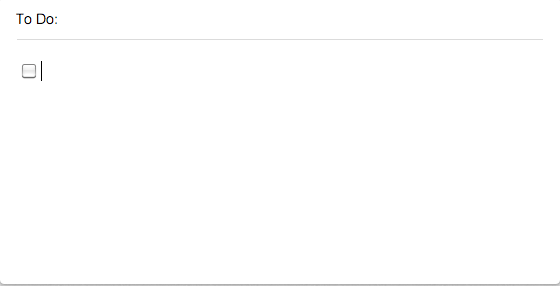 I was able to clip the web content, and the necessary citation info all in one click. Not only that, but I was then able to annotate that content, so my notes stayed right with the material. In this way, Evernote was extremely helpful, and I started to use it for everything. I soon ran into a paywall, when I had clipped so much from the internet that Evernote warned me I was running into the maximum space available in the free version of the software. Thinking it would be worth it, I ponied up the five dollars required to upgrade. Unfortunately, I would soon discover that the more information I poured into Evernote, the less functional I found it. Despite tagging options and searching, I found the layout frustrating when attempting to return to a particular note. I tried to make use of the “shortcuts” option, but that also soon lost functionality. I was annoyed by the way tags were displayed on individual posts, cutting them off from visibility when I had more than two or three, and they were also finicky in terms of editing or deleting. The software also suffered more than an acceptable amount of glitches. Sometimes updating fixed this strange flickering, but not always. 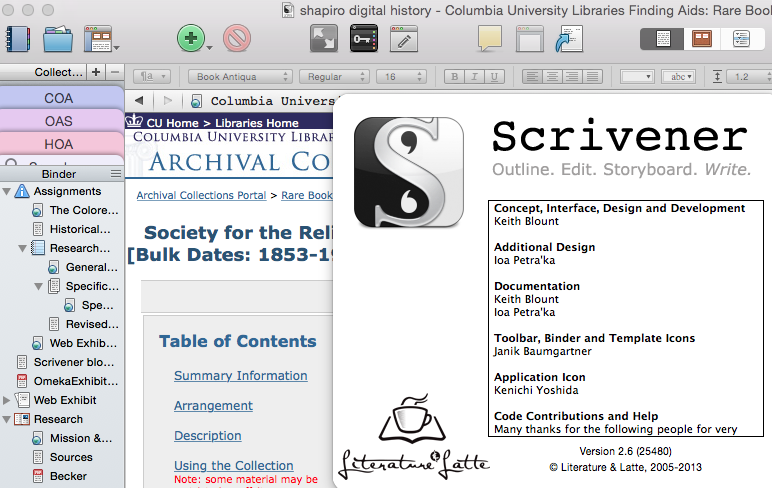 Ultimately, I think I prefer something more along the lines of Scrivener. I like the visibility of folders and subfolders, and I don’t think I need the tagging functions to keep track of information. I’m more likely to forget how I tagged something than forget what I wrote. I also appreciate the ability of Scrivener to view two pages side by side without opening a new window. This makes transcription or reference very easy. Using Evernote for a semester was a fantastic experiment and I can definitely see myself using some kind of database in the future. It was certainly easier than flipping through a notebook, trying to find the page on which I wrote a particular thought. Now, if only Scrivener had a clipper for my browser like Evernote. For my specific project, Evernote was incredibly useful this semester. The majority of my archival collection is made up of images and documents that I found on the internet. Looking through so many websites, it was difficult to keep track of where I found my source material. Evernote’s tagging tool, however, made this exceptionally easier. I tagged any website where I got an object for the archive with the term “Archival Source”. Now, I can separate these sites from others that I used solely for exhibition research. I did something similar to websites that gave contact information for the rights holder, so that I could keep all that information together. Screenshot of my tag “Archival Source” on Evernote. The tagging tool was also useful for highlighting common themes, people, and locations throughout my research. My focus changed over the course of the semester, so not everything I added to Evernote ended up being useful. That was fine though, because these notes could be filed away and did not impede access to the resources I ended up needing. Evernote worked well for this class because everything was on one platform. My research was online, all the assignments were online. It made for a lot of time spent looking at a screen, but it was easy to navigate between programs. Plus, I liked the added security of having all of my research online. Computers can break, but by placing everything online I knew my work would be protected. This would be even more useful for people who don’t have a single computer that they work on, because they would be able to access all of their research from anywhere. My traditional methodologies for research: extended note taking by hand and color coordinated post-its. I wanted to give Evernote a true shot, so in September I also started a notebook for my thesis research. This was a much less successful experience. I’m a very tactile researcher—I like taking notes by hand and marking passages in books. The act of writing forces me to summarize and analyze my thoughts, helping me get more out of my reading. Typing doesn’t have this added layer, and having to transition between the computer screen and my book greatly slowed down the process. I’ll definitely keep Evernote in my arsenal, but only for select projects will it become a major tool. Though I have been using Evernote to take notes for class for about a year, this is my first time utilizing it as part of a project to keep track of my research. While Evernote is useful even if just using it to keep individual class notebooks organized, taking it a step further revealed numerous advantages to adding Evernote to my research process. One of the biggest advantages of using Evernote is that it is available almost anywhere. It can be accessed on a phone, tablet, or computer as well as through Evernote’s website on any Internet browser. This allowed me to access my notebooks on Evernote regardless of what device I had with me or as long as an Internet connection was available. Usually, I accessed Evernote through the iPad and Mac applications, though occasionally I used the website version as well. Though the easy accessibility is great, I have found the differences between the Evernote applications to be disorienting and sometimes frustrating. Since I am constantly switching back and forth between devices, I would prefer to see a consistent layout and design scheme. Once I became comfortable using specific features on the Evernote iPad application, I would need to access it on my computer and find that the interface was significantly different. Furthermore, occasionally features would not be available on all of the applications. One example that I’ve run into is the ability to make checkboxes in lists. This feature is available on iPad and Mac applications, but is not available through the Evernote web application. Since I am constantly making to-do lists, this limitation has frustrated me. However, where this feature is available, it is great and something that I use constantly. Evernote allows users to create as many notebooks as they want. I currently have two notebooks that I am constantly updating, one for the Creating Digital History class and my personal notebook. I also have several notebooks from classes that I had in the past. The ability to organize by notebook is especially helpful when searching through my notes. Evernote’s search function allows for searching through all notes or individual notebooks. I typically format individual notes consistently in bulleted lists, although I have found that Evernote’s bullet list format is not that easy to use, particularly in regards to representing hierarchies. I also try to remember to add consistent tags to my notes, which will allow for a better search of my notes. For class notes, my tags are not very complex; I usually tag them as “reading notes” and then whatever subject matter they reference. However, the tags I utilize for my research are much more helpful. Since most of my notes document the individual items I have compiled for the Greenwich Village Digital Archive, many of my tags indicate the type of item (i.e. image, recording) and the source (i.e. Library of Congress, Wikimedia Commons). One of my favorite tools for Evernote is the web clipper, which allows you to clip articles directly from an Internet browser and save them in Evernote. Once the feature is downloaded from Evernote’s website, an elephant symbol appears at the top of your browser. This button allows me to clip any article or webpage that I find relevant or interesting and save it to my notebook. This is something that I to be incredibly useful, especially when combined with tagging. This allows me to search through these articles and is much more intuitive than saving links as bookmarks in a browser. Furthermore, articles saved using the web clipper can be accessed and read in Evernote without an Internet connection, allowing me to read them on the bus or train. Despite some small criticisms of Evernote, the positives definitely outweigh the negatives. Evernote has become a crucial part of my research process and has allowed me to be more organized with my notes.